Dinner tonight! | Arthur in the Garden. 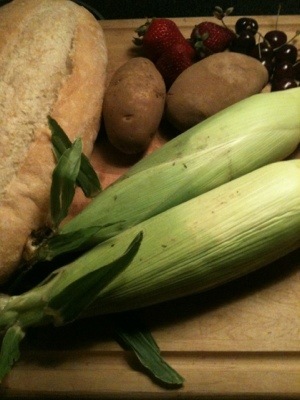 Dinner tonight from the Raleigh Farmers Market: corn on the cob, roasted potatoes, French bread, and strawberries. I love my farmer’s marked which I just started to go to. I look forward to chatting with the farmers but 102 degrees on Satiurday. Maybe next week or probably more like October at the rate things are going this year.